A newbie Yank shopper was virtually ecstatic over the retail choices in Canada, the selection of products, even in some cases even the prices. 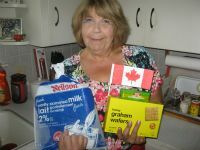 Cathy Szabo of Shelby Township, Michigan, just loves such Canadian grocery stores as No Frills and Sobeys. The prices are similar if not better, Szabo said, noting that strawberries often are priced cheaper than at her neighbour grocery in the north-eastern Detroit suburbs. Szabo also found the quantity and freshness of meat products as good or better than those stateside, although admittedly meats like poultry tend to be a little cheaper at home. One thing that isn’t so cheap is Canadian cheese, or other dairy products for that matter. Szabo, back home, can often buy a dozen eggs for under one dollar, bags of shredded cheese for just a few bucks and – with store loyalty card points – a large jug of milk for, yes, about a dollar. Speaking of milk, Szabo laughs about when she first discovered that Canadians buy milk in a bag. “I couldn’t believe it,” she says, and every time she still sees bagged milk it puts a smile on her face. One dairy product available here and not stateside is garlic butter. And she thinks President's Choice orange pekoe tea is to die for. Others discoveries are Canadian food clichés – but not available in the U.S. – such as butter tarts and peal meal bacon. Her colleagues at work have now taken to asking her to bring back packages of butter tarts. Szabo was amazed by the high degree of ethnic foods available in Canadian grocery aisles. And of course she found it kind of exotic that labels are in both English and French, and that weights and measures are in metric, which even many Canadians don’t understand. While No Frills has a conventional store layout, Szabo found it clean and well-stocked with a surprising variety of products including numerous President's Choice upscale brands. But she thought the merchandising at Sobeys was as nice as or better than anything she had seen stateside, especially the appealing deli and bakery areas. Speaking of upscale Szabo was impressed by the Shoppers Drug Mart line of cosmetics and by the store’s helpful staff. And when she went to Devonshire Mall she couldn’t believe the number of retailers that simply don’t exist north of the border. Even a discounter like Dollarama is a one of a kind find. Szabo said the product selection is wider, and the store much better stocked, than comparable U. S. dollar stores. Her latest trip included a large portable fold-up cooler and a decorative planter. The downsides to Canuck shopping? Though she feels Canadian sales staff are “extremely friendly and helpful” she has had one or two occasions where cashiers have turned up their noses when asked about the U. S. exchange rate. “It was surly arrogance,” she said of one cashier at a fast food restaurant. But there is one lasting Canuck food that will probably always stay in her memory. “I have a hard time convincing friends back home such a thing even exists,” she laughs.